This is a guest article from Stuart Westwood. I found myself wandering the streets of Arrecife the other day with a toddler strapped to my chest, whilst waiting for my stepson to finish his Brazilian Ju-jitsu class. I thought that a walk down to the main road might keep the little one entertained; he’s developed a fascination for buses, trucks and other big vehicles, and it’s amazing how long he can concentrate on something so ordinary as public transport! Not being a huge fan of urban environments, I must try to look at it through his eyes and imagine the wonder of the sights and sounds as experienced by someone who hasn’t yet become numbed to it all by years of adulthood. No daddy it’s not a bus, it’s a rolling purple window box that eats people and spits them out later… or something like that (he’s not actually talking yet). 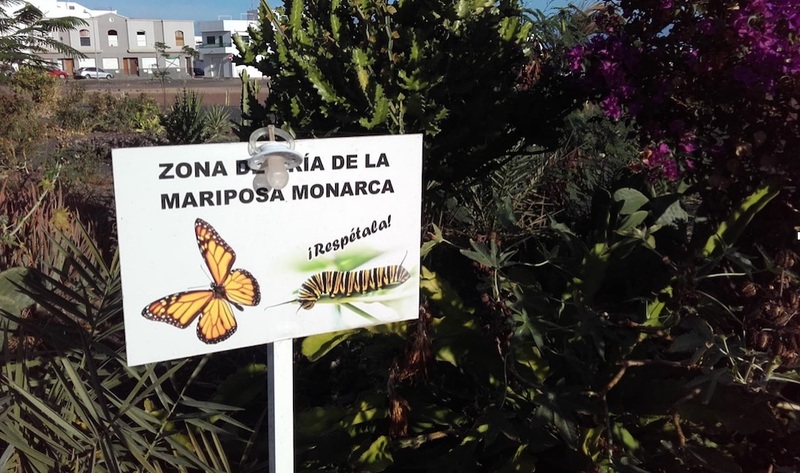 A completely unexpected, Monarch Butterfly conservation area in the middle of a car park! It looks more like a school project than an official protected area, but it surprised me in a very good way. I must admit that my opinion of Arrecife in general, is poor. Run down and in need of a lot of TLC (I was once an extra in a film about war-torn Iraq, filmed on location in Arrecife), I didn’t imagine that I would find a little oasis of green, and evidence that somebody cares for something as beautiful and fragile as a butterfly. It brought a smile to my face. Monarchs are best known for their phenomenal migrations through the Americas, from Canada in the north down to California and Mexico in the south. Whilst they are not yet officially declared endangered, owing to several human factors, their numbers are declining. It seems to be unclear how or when they originally appeared in Europe and the Canaries, but on this side of the Atlantic they are much fewer in numbers. 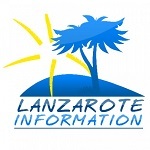 What makes it even tougher for them is that their caterpillars only feed on plants from the Milkweed family, wide-spread in North and Central America, but not in Lanzarote. I’m inspired to have a go in my own garden; I don’t miss much about my former life in northern Europe, but some more greenery and a butterfly or two wouldn’t go amiss! A word of warning about starting your own Monarch garden however; many species of milkweed are poisonous if consumed in large quantities (a note for owners of hungry pets) and can also cause skin rashes in some cases.